Subject: YOUR E-MAIL I.D HAS WON YOU $1,000,000.00 US DOLLARS!!! YOUR E-MAIL I.D HAS WON YOU $1,000,000.00 US DOLLARS!!! THE-NETHER LANDS (DAYZERS) ONLINE LOTTERY DEPARTMENT. We happily announce to you the Draw Number: 1-8 of the THE NETHERLANDS INTERNET ONLINE LOTTERY DEPARTMENT Program held on Monday the 23Rd of October, 2006. 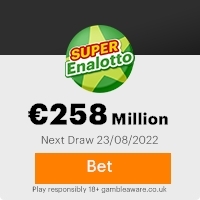 Your e-mail address attached to Ticket Number:534662925, Serial Number: 5600/04 drew the Winning Numbers 1-4-5-6-27 with (Bonus No.8), which subsequently won you the lottery in the 1St. category (i.e) match 5 lucky numbers plus Bonus No.8 Our winners are arranged into four categories with different winning prizes accordingly in each category. 1st. 8 Winners, ONE MILLION USD.$1,000,000:00 each. Your e-mail won you the prize in the 1ST category,You have therefore been approved to claim the total sum of USD$1,000,000:00 (One Million United States Dollars) in cash credited to file. This is from a total cash prize of USD$8 Million Dollars, shared amongst the first Eight (8)lucky winners in this category. All participants for the online version were selected randomly from World Wide Web sites through computer draw system,extracted from over 100,000 unions, associations, corporate bodies and indidual emails that are listed online. This promotion takes place annually. Your lucky winning number falls within our European booklet representative office in Europe as indicated in your play coupon. In view of this, your USD$1,000,000:00 (One Million United States Dollars) will be released to you by any of our payment offices in Europe.Our European agent will immediately commence the process to facilitate the release of your funds as soon as you contact him. For security reasons, you are advised to keep your winning information confidential till your claim is processed and your money remitted to you in whatever manner you deem fit to claim your prize. To file for your claim, Please contact your filing Officer for the filing of your winning immediately the receipt of this notification. MR HENRY KARL of the, APEX LINKS B.V.
Congratulations from me and members of staff of THE-NETHERLANDS DAYZERS LOTTERY, INTERNET ONLINE DEPARTMENT. For: THE-NETHERLANDS INTERNET ONLINE LOTTERY DEPARTMENT. This Email with the Subject "YOUR E-MAIL I.D HAS WON YOU $1,000,000.00 US DOLLARS!!!" was received in one of Scamdex's honeypot email accounts on Fri, 03 Nov 2006 14:55:18 -0800 and has been classified as a Generic Scam Email. The sender shows as claudia kerkhoff <claudia@ckerkhoff04.orangehome.co.uk>, although that address was probably spoofed. We recommend that you do not attempt to contact any persons or organizations referenced in this email, as you may expose yourself to scammers and, at the very least, you will be added to their email address lists for spam purposes.